By default WordPress enables WP Embed code to each page. That means you could embed any of your WordPress post to any other post with just simple URL. You could just paste a URL under WordPress admin Edit Post section and WordPress will render it with nice Heading, Content and Image. That’s really great addition to WordPress when they released this feature in version 4.4. On Crunchify, we have disabled this WP Embed feature since long time as we personally don’t have detailed use case and plan to embed post directly into another post. If you have using WP Embed functionality on your site then you may want to check out on how to Set oEmbed Max Width in WordPress? 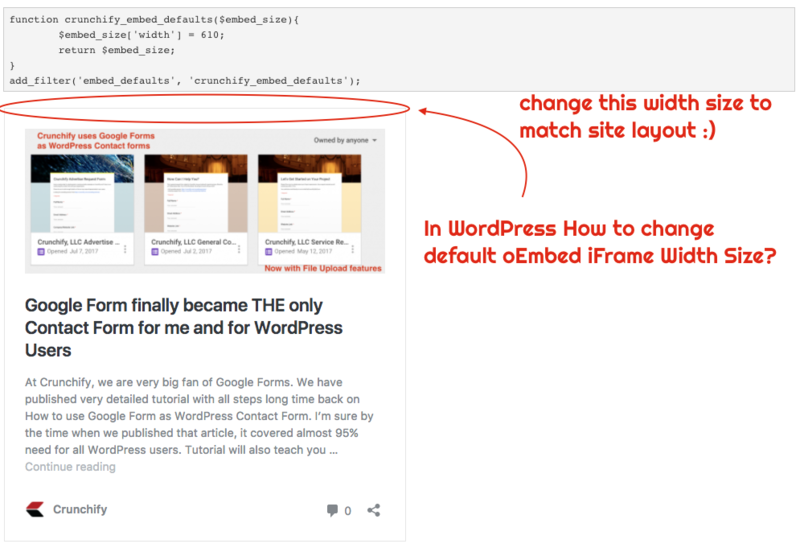 oEmbed – How to change default width parameter? Just put above code to your WordPress theme’s functions.php file. As you see in above code, I’ve provided Width to 610px which is what I wanted on Crunchify.com. Please change it accordingly. Once you set Width for WP Embed posts, height may be overridden by embed_defaults hook to match best for your site layout. WP Embed & How to change width and size of your Youtube video? By default when you paste a youtube URL, WordPress renders video on site automatically. It’s so simple, nothing you need to do in order to play youtube video in post. Now what if you want to change height and widget of your youtube video? Please use below code and youtube video will render with newly provided height and width. Let me know if you have any problem updating Embed code width and height for any of the available shortcodes. Currently we running out site Crunchify on WordPress v4.8.1 and it supports all of these below Embeds.